Two recent research publications funded by AWCF were just published. The first study examined the effects of forest management,including herbicide applications, on prairie warblers, while the second study examined eastern whip-poor-will breeding ecology. PDF copies of the publications are below. Assessment of Non-native Earthworms in the Adirondacks. SUNY College of Environmental Science and Forestry-$2,000. Objectives: To determine the species of non-native earthworms in the Adirondacks, their distribution and relation to soil and vegetation characteristics. Morris Animal Foundation, Denver, CO. - $2,000. Objective: To determine if PAH found in eggs can be linked to the BP oil spill in the Gulf of Mexico. Progress: Preliminary results show that the eggs of migratory birds (White Pelicans and Double-crested Cormorants) contained higher levels of PAH's (poly-cyclic aromatic hydrocarbons) than those in the eggs of non-migratory Canada Geese. Hopefully, this information will help in policy making decisions. Ecology and Breeding Habitat of Bobcats (Lynx rufus). Univ. of Minnesota - $2,000. Natural History of Wood Turtle Populations in Southwestern New Hampshire and Recommendations for Management. Antioch University, Keane, N.H. $2,000. Movement Ecology in Muskrats: influence of personalities, kinship and predators. Ithaca College, Ithaca, N.Y. $2,000. Objective: To build a prototype acoustic sensor system to detect flying vertebrates (birds and bats) collision sounds at two commercial wind turbines. Results- Study confirms the feasability of using an acoustical method of recording rotor strikes by birds but requires further refinement to standardize the technique. There were no recordrd alarm vocalizations by birds although there were many bird passages through the rotor-swept zone." The Effects of Invasive Shrubs on Insect Abundance and Breeding success of Songbirds in Power-line Corridors. University of New Hampshire - $2,000. Objective:To determine if non-native, invasive shrubs affect the breeding success of songbirds by reducing the amount of insects available to them for food. Owl Cavity Nesting Project for Small Owls: Northern Saw-Whet and Western Screech Owls in Forest Conservation and Management. The Owl Research Institute at Ninepipes Center in Charlo, MT - $2,000. 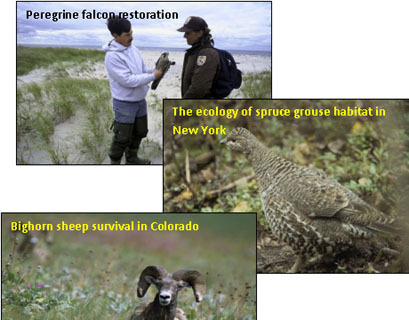 Studies include nest site locations and characteristics, fledging success and banding studies. A recent publication - "Tiny Terror of the Skies" by T. Dickson in National Wildlife, June-July 2009, pp 35-39 provides interesting information on Northern Pygmy Owl ecology and characteristics. Estimation of Eastern Coyote Abundance Through Distance Sampling and Vocal Surveys. S.U.N.Y. College of Environmental Science and Forestry, Syracuse, N.Y. $2,000. Following several local pilot studies to assess the reliability of the technique, coyote locator calls were used at 579 stations to determine coyote abundance throughout New York State. Response rates were sufficient to allow a credible estimate of New York's coyote population and represent the best estimate to date. Habitat Associations and Movement Patterns of Reproductive Female Wolverines on Southeast Alaska's Mainland" Wolverine Foundation, Inc. Kuna, Idaho $2,000.